1. Follow the cake mix directions on the box. Pour cake mix in only two cups of the cupcake pan. 2. Put the rest of the cake mix into a greased mixing bowl. 3. Bake the cake for 60 minutes and the cupcakes for 20 minutes at 180 degrees C/350 degrees F.
4. Let the cake cool for ten minutes. Than flip it upside down and let it cool on a wire rack. 5. Place the cake on a plate, rounded side up. Frost the surface with red frosting. 6. Take the two cupcakes and cut off the tops with a knife. Put frosting on the cut sizes of the cupcake tops and then place the frosted side together. 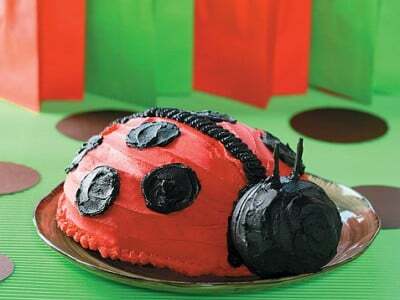 Use that as the ladybug head. 7. Using the tube of black gel frosting, pipe a line down the centre of the cake to look like wings. Then, draw large black dots. 8. Use small pieces of liquorice rope and stick them into the head to create antennas.